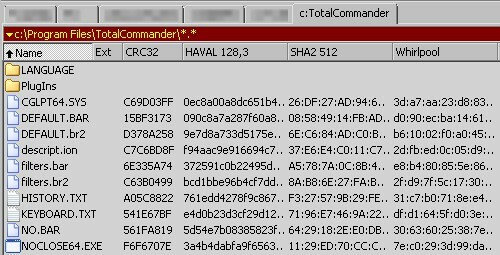 LotsOfHashes is a simple 32/64-bit content-plugin for Total Commander. LotsOfHashes is able to calculate and display hash values for any file. 2013-12-01: v1.4 * ADDED SHA3 (Keccak) hash algorithm in now supported (224-bit, 256-bit, 384-bit and 512-bit). * CHANGED Shorted field name format of compare content (removed the "codes" string). 2013-01-09: v1.3 * CHANGED A better way to handle errors after CreateFile. * CHANGED Close the file handle after CreateFileMapping; it's no longer needed. * ADDED MurmurHash3 hash algorithm is now supported (32-bit and 128-bit). * ADDED Salsa10 and Salsa20 hash algorithms are now supported. * CHANGED Code refactoring: Rename methods of hash classes (Crc32,EDonkey2k,Gost,Haval,Md4,Md5). 2012-10-02: v1.2 * FIXED Minor bug in the way memory is freed in the cache mechanism. * FIXED Exception when file is empty. Check for zero file size before accessing cache. * CHANGED Remove dependency in Windows cryptography (Wincrypt). MD5 and SHA1/SHA2 algorithms re-implemented. * ADDED SHA2 224 hash algorithm is now supported. * CHANGED Current CRC32 algorithm was renamed to CRC32b (algorithm used by PKZIP). * ADDED CRC32 hash algorithm (used by ethernet and wdHash) is now supported. 2012-09-23: v1.1 * FIXED Missing ANSI functions added in addition to existing Unicode functions. * CHANGED 32bit file extension renamed from .uwdx to .wdx. LotsOfHashes.uwdx is obsolete and can safely be deleted. * ADDED MD4 hash algorithm is now supported. * ADDED eD2k/eMule hash algorithm is now supported. * CHANGED Field names slightly modified for better categorization. Format: "hash_name [digest_size],[passes]". * ADDED Two new field units/choices. 'Delimited uppercase' and 'Delimited lowercase'. * ADDED In-memory cache for performance (avoid recalculation of large unchanged files). * ADDED Configuration file (LotsOfHashes.ini) for cache parameters. See Notes. * FIXED Doesn't ignore directories. 2012-08-29: v1.0 * Initial release.